"A monster with a mighty cannon barrel, it is able to integrate its attacks. It attacks in many ways by combining and separating with other monsters." This week we're looking at a neglected Magician's Force combo that can be very deadly if pulled off right. Today we're looking at the 3 basic Monsters that form all of the XYZ forms. X-Head Cannon has some plusses. Basic beatstick at 1800, if you're boosting with Luminous Spark then you've got a decent monster going here. Witchability is always a plus. If you have multiple pieces in the first turn, this is the one you will usually start out with. Y-Dragon Head: Sanganable, but not Witchable. You usually won't use its effect of equipping just to get X to 2200 -- if you want a 2200, play Goblin Attack Force and get 100 more. Most of the time if you have X and Y out you'll be fusing to get XY (or XYZ). Z-Metal Tank: Sangan AND Witch-friendly. Not much on its own, but now you may seriously want to consider equipping. 2400 isn't something to scoff at in this game -- no commonly played 4-star monster is going to take out a 2400 without an Equip Magic. Why do you think Jinzo is so safe? For all 3 pieces, they're all Machines, so you can get a good Limiter Removal shot off if you have an open field. I'm going to give them a composite rating, despite talking about each card separately. The pieces as a whole get a 3 out of 5 -- nothing spectacular unless you get them all together, but a lot of potential here. infinitekhaos This was the first set of cards I wanted to see reviewed before i joined this staff, tssk tssk, forgive the late review folks. Alright, the X-Head Cannon, its a good machine beatstick in a machine deck if you can't get your hands on chasers. Without the other pieces he can be decent, run him with Jinzo and two Barrel Dragons, then three Limiter Removals, what fun. Other than the fact that it's a machine, he's just another run of the mill 1800, and he's searchable via Witch of the Black Forest. The Z Metal Tank. This is the fastest of the three, being searchable via Angel, Witch and Sangan. This attaches to both the XHC and the YDH. The boost it provides is somewhat impressive for a union (GASP..AITSU...KOITSU!). 600 pts can go a long way in this game. Attached to XHC, you get a lvl 4 2400ATK machine, stands face to face with Jinzo. Attached to YDH you get a 2100ATK machine for a lvl 4, which isn't bad. Now the whole concept of unions can be very interesting. It saves the equipped monsters from dying in battle, but then your monsters can also die via MST, Heavy Storm, etc. Would I run it? Well it is possible to win a tournament winning deck, but there's too much involved in that, its a deck worth building but only for fun or casual play. Closing Line - GO GO XYZ!!! THE EVIL SPACE ALIENS ARE INVADING! DEFEND THE EARTH! With 1800 ATK, this card is one that makes playing Machine decks respectable again. If it had come out a year ago, who knows? Maybe Machine decks would have been the majority instead of a novelty. Now, with all the 1900 ATK-ers out and Tribe, it still takes a little support to keep this guy alive. Outside of Machine and Light decks, this card by itself is nothing different from La Jinn, Harpie's Brother, etc. It's potential and corresponding ratings will be addressed in future COTD's this week. 3.5/5.0 A good ATK and more potential than most other non-effect monsters. This card is weak on the ATK, but 1600 DEF helps. It's effect shouldn't be underestimated. It can be Special Summoned with Frontline Base, Last Will, and Shining Angel. Once you have this card and X-Head on the field, you can unite them to form a pretty strong Machine with 2200 ATK. A well-timed Limiter Removal and Combination Attack can mean a quick victory. In my opinion, the Union form is better than it's Fusion counterpart, unless you need to get rid of a Swords, Gravity Bind, Imperial Order, Premature Burial, or something similar. 3.0/5.0 A medium level attacker with the ability to work very well with X. This card is a little bit trickier to play. It will not be as likely to survive, having only 1300 DEF. On the other hand, the ability to add 600 ATK to X or Y can really help out if you are going up against a tribute monster. That is, if you still have an X or Y on the field. This card is a little too situational to be useful as a monster, and requiring a summon to get onto the field is too much if you play an X-Y-Z deck without support to get some extra Special Summons. 2.5/5.0 A medium level attacker with a more vulnerable DEF with all the 1400-attackers. Combos: If you can take any of these 2 combined as Unions, with a clear field you can demolish your opponent with a Limiter Removal attack, then Combination Attack. Example: Z equipped to Y (weakest Union combo) -- LR then attack = 4200, then Combination Attack = 4200 + 1500 = 5700; 4200 + 5700 = 9900. Frontline Base can get you an extra summon for Y and Z, just make it count. Omega Ah my old friends X, Y, and Z, A solid backbone to any good machine deck. Not only are the 3 monsters fairly strong on their own, they can “Unionize” to create stronger monsters without the threat of removing them from play for the fusion. This is a good alternative if you don’t care about the effects, and all you want is higher attack power. On the plus side when your monsters are unionized and are destroyed, only the union monster is sent to the graveyard and your original X or Y stays. Plus they are machines which right then boosts their playability due to Limiter Removal. In order to get your Y and Z out faster than normal, use the magic card Frontline base to special summon the Union monster, then normal summon X and Unionize. Tony The X Y Z rating time has finally arrived! Rating: 8/10 in a Machine/XYZ deck. Y Dragon Head is another DD Warrior Lady Stats Monster; searchable by Sangan but not by Witch. =\ If you wanted to run a true XYZ deck, Shinning Angels would be in your deck along with this card. It's a Light type monster, it's searchable with Shinning Angel, AND the Z-Metal Tank (1500/1300) and DD Warrior Lady is also searchable too...interesting...but back to the card it self! It's a union monster. + Combos with Limiter Removal Quite Well. + Can hold its own if XYZ or counterparts aren’t achieved. - Still no match for 1900s. - Usually comes with an XYZ strategy (Or machine) which is not the current strong deck-type. Let’s Face it; XYZ type decks have no real strategy. 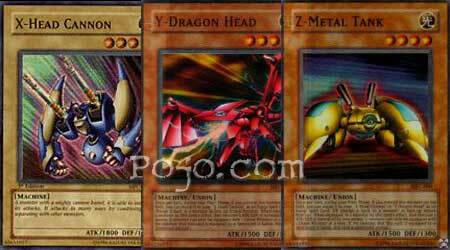 You’re basically using 3-4 cards in order to be able to discard MORE cards to destroy their monsters. That’s rating the strategy itself. This certain card is a machine, thus helping Machine decks quite well. Tribe may affect the strategy, which is why I plan to stick with my current deck. X-Head cannon is part of the XYZ strategy, which to me is a random style of play. I haven’t seen an XYZ deck because the cards are expensive and not good for play, kind of like Jennifer Lopez in a way. + Ugh. I guess the 400 boost counts. You can pretty much see my opinion of this card. When this card turns to an equip, remember to treat it as a spell card and put it in the spell/trap zone. Also, it may be destroyed by MST/HFD/HS and is placed in the graveyard and upon doing so treated like a monster. Now, Once it’s turned into an equip remember that if they fissure or something to the monster both die. That’s crazy for seeking advantage. XYZ decks try to get advantage through destroying things by discarding, that’s entirely too hard to do (Waboku, I’ll just flip and respond to it thus wasting the card you discarded). + Adds 600 as opposed to 400. + Can Equip Both, not just one. This card, for this rating only, I am comparing to Y-Dragon Head for the sole reason that it’s been talked about. This card adds 600, which exceeds 400, and is both witch and sangan able. Also, this card can equip both as opposed to just one. Personally if you’re going to run something other than XYZ I wouldn’t use this strategy. Sure you can add 600 and have a nice 2400 attacker on X, but Jinzo can do that with a nice effect. Also an equip can do better. And even if you use XYZ, find other means of getting XYZ out than stalling with a union card equipped to X or Y. It would be smart to possibly stall for time to get out XYZ or something in order to maybe use its effect enough to gain some sort of advantage. Even that’s flawed, VERY flawed. :Closing of the Day: As this week rolls on I will somewhat give you more and more of my thoughts of XYZ. Right now my thoughts are to use Limiters along with X cannons for maximum results. Don’t try equipping unless the situation tells you to (V-Lord/Goblin/anything that will kill you if you don’t kill it first). Stats: Being a Level 4 Monster is pretty good-obviously in the current environment, being a Level 3 would be a touch nicer, but Gravity Bind decks seem to come and go in scattered locations. Being a Light Monster is pretty good-it’s one of those attributes that actually can support a few themed-decks (even if they are all beatdown variants). It’s also nice since that means you could use them to pay for Chaos Monsters if need be. Being a Machine is a definite advantage-yes, there are/will be cards that negatively affect Machines only, but from what I’ve seen. The good out-weighs the bad. Just gotta love tripping a Limiter Removal (or 3-they stack unless that’s been over-turned) when your opponent attacks. Being a normal monster is not really an advantage or a disadvantage, though being a Union Monster is an advantage (even if most of them aren’t so hot). The Attack and Defense scores vary by only a few hundred in either direction, but it really matters. X-Head Cannon can be searched out via Witch of the Black Forest , and only by her. On the bright side, since it does have an 1800 attack, it is a solid (but not exceptional) attacker in its own right. Y-Dragon Head can be searched for with Sangan, as well as Special Summoned through Shining Angel’s effect. Neither its attack nor its defense is great, but it can hold off most support monsters at least. Finally, Z-Metal Tank has the least impressive stats, but that also means that it can be searched out using any of Witch of the Black Forest , Sangan or Shining Angel. Even though they are a touch lower, 1500/1300 is still strong enough to take out supporting monsters like a Don Zaloog in the attack postition. Card Text: X-Head Cannon’s is just flavor text, but at least it makes sense. Y-Dragon Head’s Union effect grants a 400/400 attack boost and gives a modest insurance policy to X-Head Cannon. Not great effects, but at times useful. Unfortunately, like all Union Monsters you need them both on the field to use this effect, and changing into an Equip card makes it vulnerable to the ample Spell/Trap Removal. Z-Metal Tank’s effect is the same, save for the bonus being a 600/600 bonus. All that effort for a 2400 attacker, you might as well stick to Jinzo… good thing there’s more. Uses/Combinations: Well, there are many cards designed to aid Union Monsters (a few too many to list-fortunately, you can just search the spoiler). Of course, the real reason these cards are played is for their fusions. Why didn’t I list that with Card Text? ‘Cause its not in their card text-the effect that fuses them is listed on the Fusions themselves, so it gets mentioned here. Most of the Fusions have decent stats, though you should stick to the XYZ-Dragon Cannon in my opinion-it requires the most work, but the effect let’s you discard a card from your hand to nuke any of your opponent’s cards on the field. Obviously, you should use this with Sinister Serpent, and when you do, it can gain you field control fairly quick. While it’s nice that the Fusions do not use Polymerization, unfortunately all the monsters need to be on the field. As such, in addition to the normal dump and recursion techniques, Ultimate Offering might be worth a shot. In addition to those, try to take advantage of their useful Attributes and Types as stated above. Constructed: 3/5, 2.5/5, and 2.5/5. Yes, they are they essential for the XYZ Fusion decks, but that doesn’t mean the individual cards are all that great. Limited: 3.75/5, 3/5, and 3/5. There stats are a little more solid in this format, and there is always the chance (no matter how slight) you’ll pull more than one of them.